Underground Media: Reloaded: Say it ain't so! Apple and EMI Music have apparently reached an agreement to distribute music *without* DRM. Why is this important? 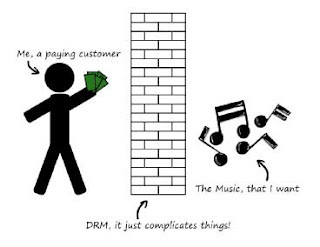 DRM is the nagging little sister that cramps your cool teenage digital lifestyle. Put simply, it keeps me from doing what I want with music that *I* purchased. It's supposed to keep piracy at bay (yeah, that's really worked out for them), but what it really does is cripple my media devices and my computer. And although Steve Jobs (aka Leviathan, Beelzebub, The Great Deceiver, and He Who Must Not Be Named) has advocated for the end of DRM, his pleas have been a tad disingenuous. Apple's iPod DRM scheme has maintained an iron-clad vendor lock-in, keeping almost every other competitor out of the market. People regularly walk into their local Big Box retailer and ask which is the best iPod, when they are really referring to all of the MP3 players. (Think Kleenex vs. facial tissue, or Coke vs. soda). So, now that Apple's monopolized the market for the last five years, they are striking a deal for DRM-free music. Just in time, right? On the other side of the digital divide, Emusic has been offering DRM-free downloads for years. Sure, they are an indie-scene site. But unless you've been hiding under a rock for the last few months, the indie scene is currently producing some of the BEST new music. Sorry, Apple. Giving us the reach-around after five years of bending us over with no lube is not going to win you any friends on my side of town.